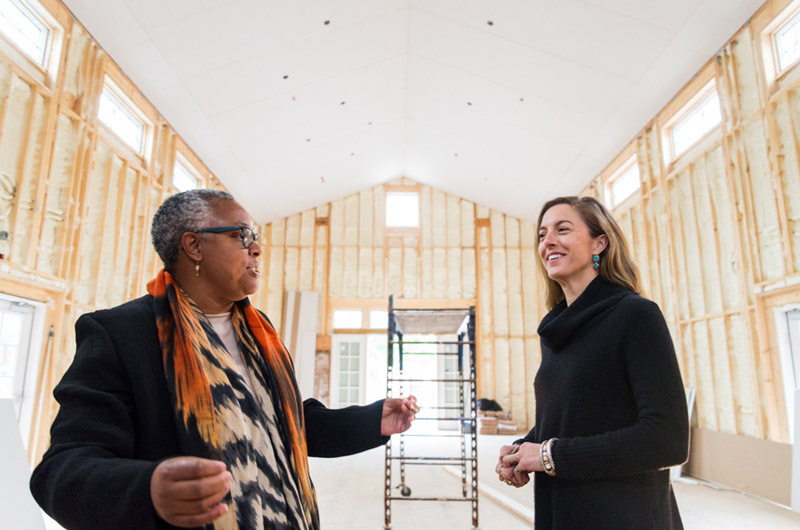 New art barn has two classrooms, a gallery, conference room and kitchen. Ann Smith and Posie Haeger stood on the deck of the Art Barn, part of Featherstone Center for the Art’s recent addition to their campus. After years of dreaming, the expansion plan had been realized. 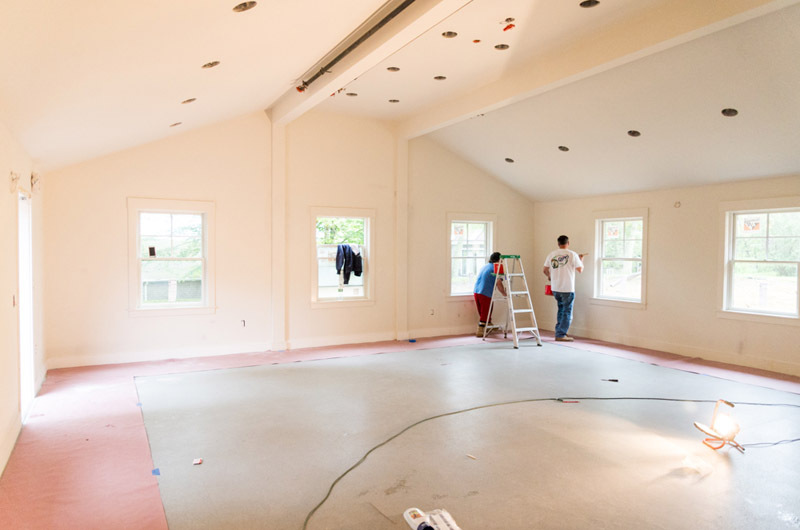 Thanks in part to an anonymous donation of $2.89 million in July, Featherstone was able to complete the new barn and a pottery studio, greatly expanding the facilities for the art center’s wide range of classes and events. 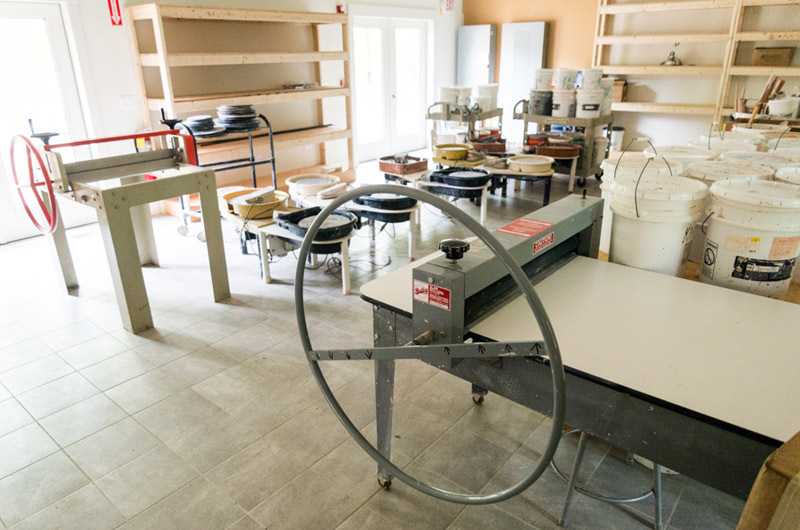 At 2,400 square feet, the pottery studio is triple the size of the old space and features outdoor gas kilns and ample workspace. 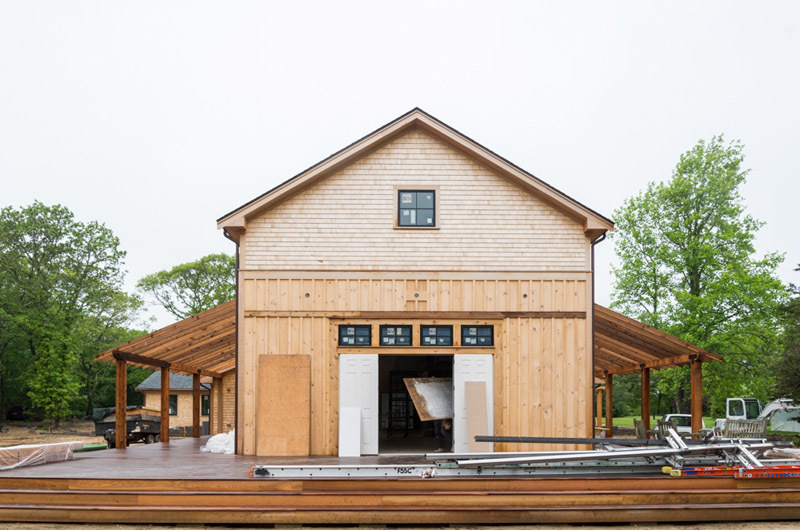 The 6,200 square foot Art Barn includes two classrooms, a teaching kitchen, a conference room, office space and a gallery. The gallery was named after Francine Kelly, Featherstone’s second executive director who died on Jan. 8, 2017 at the age of 77. The plan to expand Featherstone was Ms. Kelly’s dream, who took over from former executive director Peggy Pinney in 2003 and served until 2010. 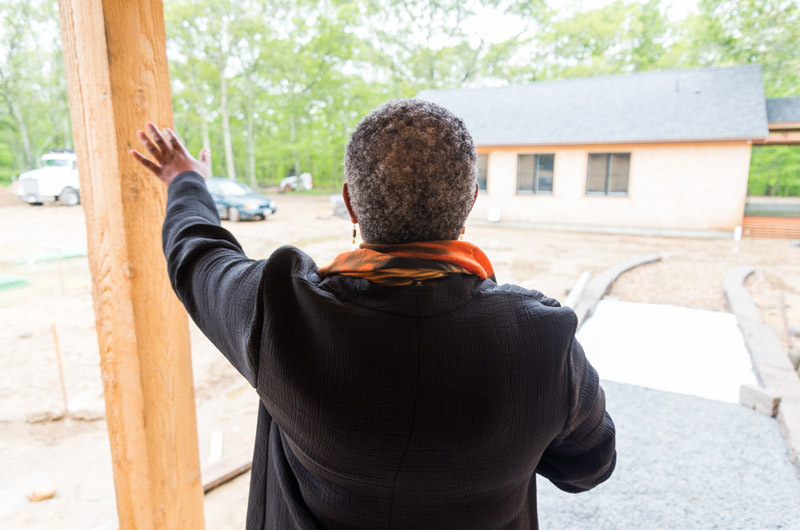 “She lived to see us through the groundbreak, but I know she’s looking down on us and sees it every day,” said her daughter Ann Smith, who took over as executive director in 2010. Originally a farm owned by Mary and Bill Stevens, Featherstone became an arts center over 20 years ago. But after two successful decades, demand for space had exceeded supply. Some classes took place in an old horse barn and other classes were squeezed into a studio designed for one person. Five years ago, a survey about what Featherstone most needed was distributed to students, teachers and the larger community. “The main thing we heard from people was we need more space,” said Ms. Smith. The Francine Kelly Gallery itself is massive. The single room measures 1,500 square feet and is 14.5 feet tall. Movable gallery walls will be used to alter the space for a variety of exhibitions. “It’s the first purpose-built art space on the Island,” said Ms. Smith and Ms. Haeger, the development director, in unison. The Art Barn also features a new children’s studio with its own bathroom and communal office space. “It’s such a huge improvement for us all to be together,” Ms. Smith said. Drawing and painting classes will be held in two 24 by 24-foot classrooms. Between the new barn and the pottery studio is a courtyard which will serve as outdoor classroom space. “We were concerned with having buildings that fit naturally into the landscape,” said Ms. Haeger. Squash Meadow, the construction company for the build, worked to remove as few trees as possible, sometimes winding walkways around tree roots. The buildings sit below the tree line and are barely visible from Barnes Road. “Ceramics is our most popular medium,” said Ms. Smith, standing in a room in the pottery studio intended for glazes and kilns. With other areas for handbuilding, wheel throwing and slab rolling, the space will now meet the demand. The completion of the two buildings is the first phase of development for Featherstone. The second phase is renovating the existing buildings. With the help of further fundraising, the old pottery studio will turn into a fiber arts barn, and the former gallery will become a photography space with digital and film facilities. Pausing in a foyer outside the new gallery, Ms. Smith pointed out the four skylights above her. This area has been named the Founder’s Atrium. The skylights are dedicated to the four women who were instrumental in the creation of Featherstone: Mary Stevens, who owned Featherstone Farm, Kappi Getsinger who served as secretary, Virginia Besse, a founding member, and Helen Bowring, another founding member who served on the board and in various committees. “The four women painted together and really were the group of people that decided to turn the farm into the arts center,” Ms. Smith said. New generations in each of the four women’s families continue to support Featherstone. At the pottery studio’s ribbon-cutting on Sunday, three generations of Ms. Bowring’s family were present, including her daughter Pam Flam, co-chair of the building committee, who cut the ribbon. The jumbo scissors were also wielded by Anne Besse-Shepherd, the daughter of Virginia Besse and Ms. Flam’s co-chair on the committee. Ms. Flam’s daughter Molly Flam was at the celebration too, along with her son Jamie. Pam Flam said that Featherstone was an essential support to her mother. “After my dad died she really dove into art and she felt that art really carried her through that difficult time,” she said. Ms. Bowring took classes at Featherstone until her death last spring at the age of 93. Mr. Getsinger’s daughter Meghan now teaches at Featherstone’s summer art camp. But it’s not over yet. Featherstone has raised $4 million of its $6 million goal and is looking to the community to complete the task. While the finishing touches are made on the buildings, Featherstone’s summer programming will carry on as usual. The summer camp caters to children age three and up. The Flea and Fine Art Market begins on July 11 and will be held every Tuesday. Jazz Night is on Thursdays and Musical Mondays begin June 26. Billy Collins, former poet laureate of the United States, will give a reading on August 15. The next fundraising event will be an art sale on June 23 from 12 to 7 p.m. and June 24 from 10 a.m. to 5 p.m. Over 70 Island artists donated their work and the pieces can be bought for a minimum donation. The Art Barn will officially open with an inaugural show in mid-august called Big. “It’s about big work, big ideas and a big new space,” said Ms. Smith.